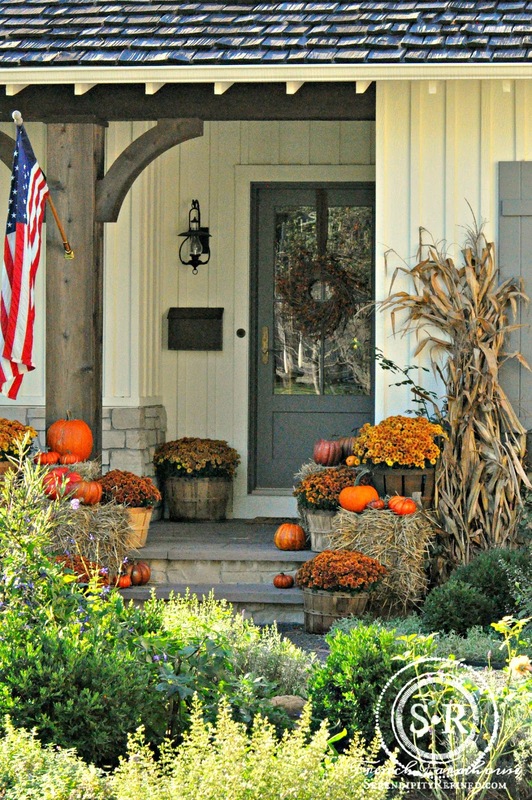 Welcome to fall on the farmhouse porch! I realized as I was taking these photos that a year ago, we still didn't have a lawn or landcaping so it's especially fun to decorate the porch for its very first fall this year. My decorating this year was limited to things that I already had on hand supplemented with just a few seasonal items. 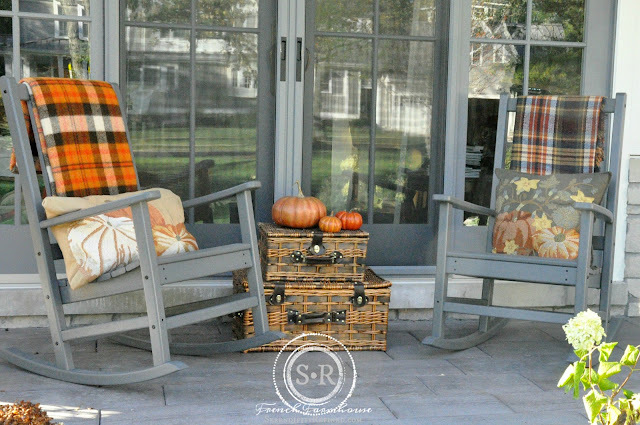 A couple of pillows and cozy plaid blankets on the rockers, a stack of wicker baskets and some pumpkins. 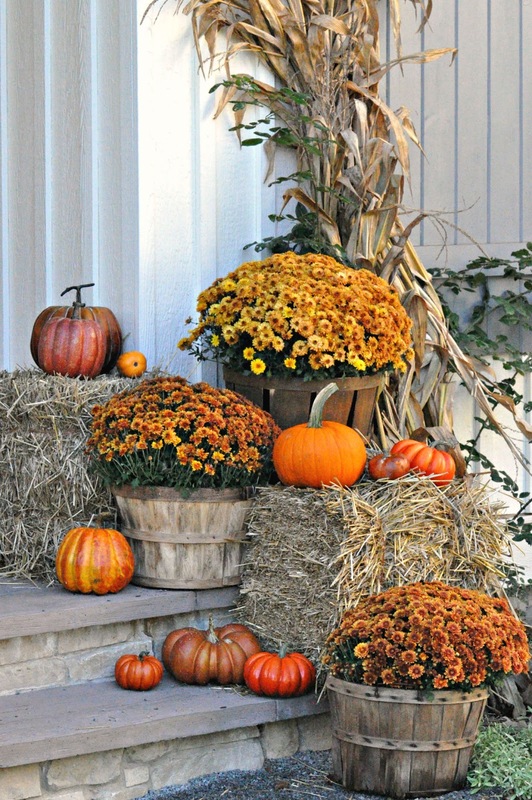 Small straw bales, corn stalks, and mums in the baskets that I "aged" a couple of years ago line the steps to the studio entrance. 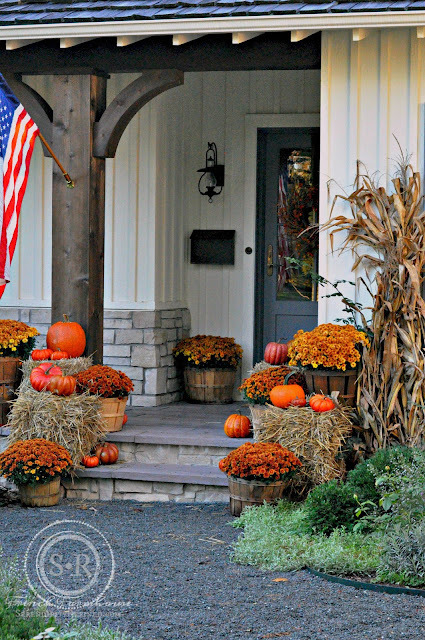 I love the rust and yellow mums and orange of the pumpkins against the gray and ivory of the house. 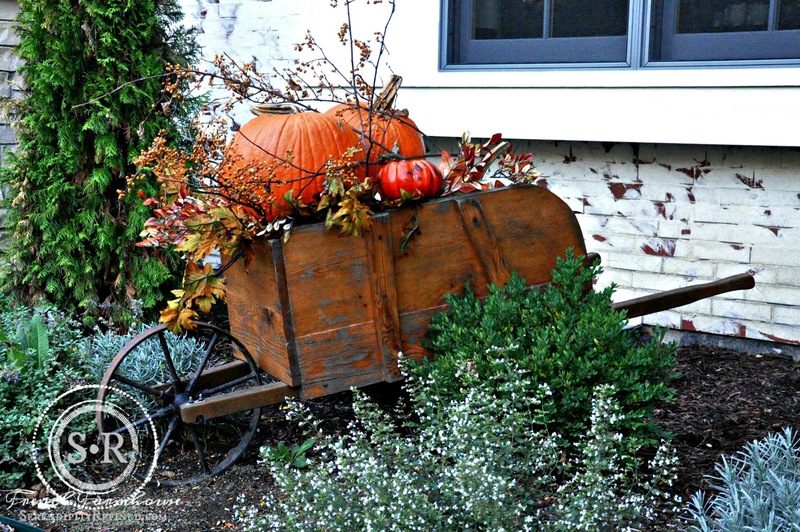 I also unearthed this fabulous wooden wheel barrow in the shed and filled it with pumpkins, bitttersweet and faux leaves. It sits in the flower bed beside the gravel path leading to the front door. You can see it on the far right in the photo above. The weather hasn't been cooperating when I've had time to photograph so some of these photos were taken at dusk. 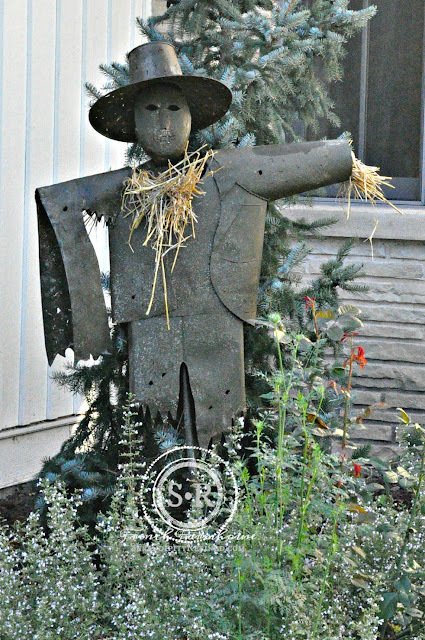 A crusty metal scarecrow points the way to the front door. 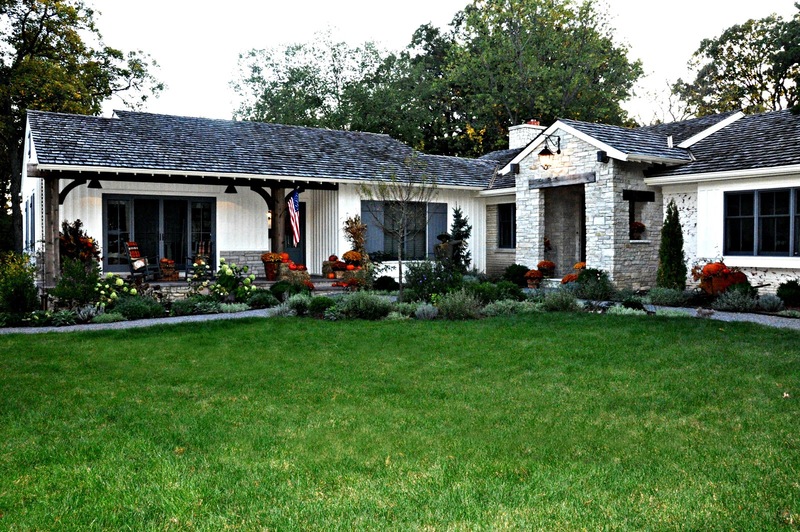 I'm excited at how much the landscaping has grown in the past year. 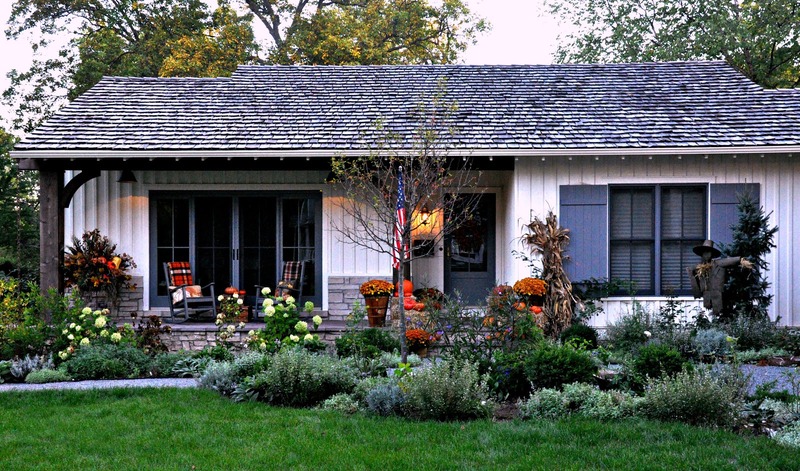 Our home is feeling less "new" as things grow in. On the inside, we're still working on trim and finishing the kitchen. If you follow along on Instagram, you've probably realized that in addition to my full time job, I'm also working part time for a florist doing event staging and planting urns and planters for clients. 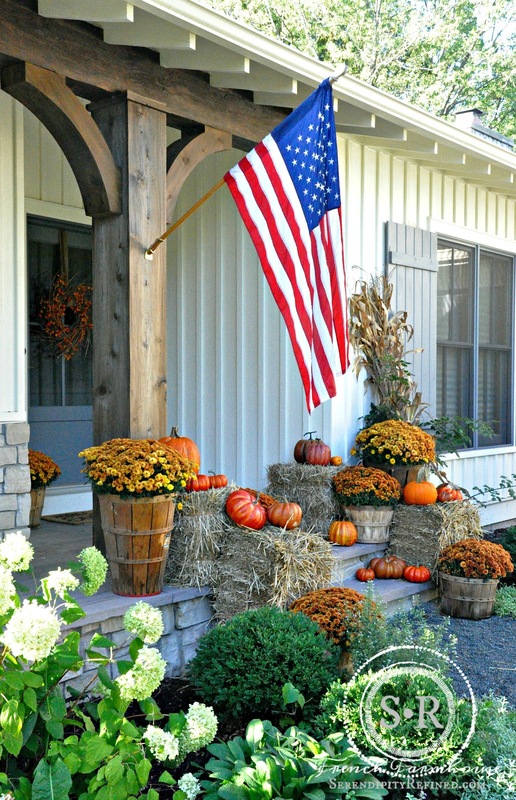 Of course, this leaves precious little time for working on the farmhouse or for decorating so I'm especially happy to have a little fall porch decor to carry us through until Thanksgiving. As always, I appreciate your taking the time to read and follow along.